What to do when all your friends are at Burning Man? Here are six fun activities to inspire the Maker in you. You may have noticed a few strange occurrences this week: rush hour seems lighter, there are no lines at the grocery store and you can suddenly find parking in San Francisco. As many of us know, this is the week of Burning Man. The city has cleared out and headed to Black Rock Desert in Nevada to show off their creativity, display feats of engineering and adorn themselves in furry costumes. 1. 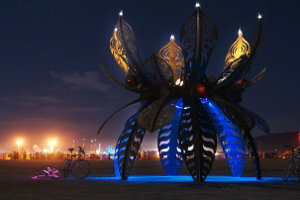 Visit Burning Man art in the city: Both the Raygun Gothic Rocketship at the Embarcadero and Ecstacy in Hayes Valley were unveiled at Burning Man in years past. They are amazing feats of engineering, art and ingenuity and definitely worth a visit. 2. Take a class at Tech Shop. They are a great resource our us DIYers in the Bay Area. They offer over 20 classes a week in everything from laser cutting, sewing, electronics and CNC mills. Their current space is in Menlo Park and a second location will be opening in the heart of San Francisco soon. 3. Go to the Exploratorium! One of the most fun creative spaces for engineers and DIY freaks, I could spend hours getting lost in their exhibits. Best of all, It’s free tomorrow night. 4. Visit a science cafe. The East Bay Science Cafe is meeting tomorrow to talk particle physics with Dr. Beate Heinemann who will be discussing the Large Hadron Collider. 5. Take a walk in the wild with Forage SF. Learn about all the edibles growing in our back yard on this East Bay walk on September 4th. Future walks take black on both sides of the bridge, but they sell out quickly! 6. Go to Balsa Man. On Saturday evening, the same night that “the Man” will burn in Black Rock City, tiny pieces of art made out of balsa wood will be burnt off the San Francisco coast in what is akin to a much tinier and shorter Burning Man like event. With so much cool stuff going on, this is a great week to be in town. Enjoy! Laura is a marketer by day and nerd by night. She's the Chief Nerd Herder for Dorkbyte, a blog devoted to art, technology and science. She's been named one of the most engaging women to speak about technology and has been featured on The Setup. A member of Noisebridge, she is working on two robotics challenges, leading a puzzle team that competes in a variety of puzzle challenges throughout the US and monkeys around on ham amateur radio. She loves astronomy, Making and hardware hacking. She was most recently involved in teaching hardware circuitry at Maker Faire.Laura has executed marketing strategies and campaigns for tech startups in the Bay Area. Her work with social media has been inducted into the Viral Marketing Hall of Fame.